With under two months until fair, it finally struck me that I can't just focus on riding. I realized that Ypke really wasn't familiar with certain showmanship maneuvers, and it is time for that to change! She can walk/trot in hand, halt, back, and do forehand turns well... but squaring her feet, haunch turns, and leading from the off-side? Not so much. 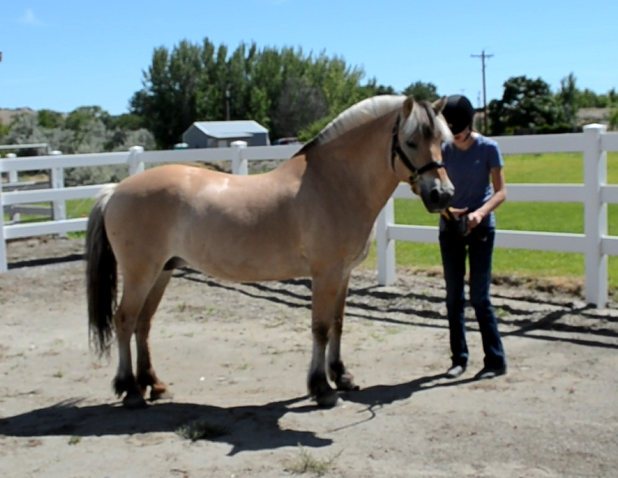 Today I brought out the clicker and treats and decided to teach her how to square. At first she was quite confused and seemed surprised whenever she would get a click and a treat. I could really tell that she was deep in thought and gradually the time it took her to square got smaller and smaller. Yay Ypke! I would give her a treat once every ten seconds that she was still standing square, but once she moved I made her square up again. She finally took the hint and stood there quietly. In the beginning it really was a complete fail. She would stop almost square, but then a struggle ensued as she alternated between taking a whole bunch of tiny steps slightly forward and slightly backward to square just right. It was just like someone who can't parallel park: backwards, forward, WAIT STOP, nope a little forward, STOP, backwards, no that is too far back, forward, NOT THAT FAR FORWARD. The problem with Ypke is that she has no concept of small. She thinks bigger is better, so it took me awhile to get her to take smaller steps. I think it is more of me getting the cue with the lead just right — it is a delicate balance between not using too much or too little pressure. That's how Cole is--bigger the better. Since he is mostly Morgan, he decided that instead of standing square, he will park out. The time spent reinforcing it really payed off, because now it is his default. Anytime I am leading him and I stop, he automatically parks out and stays there until I tell him otherwise. I bet she will get just as good with standing square. Nice, that is my goal with Ypke- whenever we stop she automatically squares. i definitely want to follow your successes (or challenges) because i really find this sort of thing neat! my cat has responded well to the clicker training and he's been doing some fun tricks with the family now. so i would love to see what practical and novel tricks ypke will learn with you! SMS is so fun to do :) I've practiced it loads with my mare.